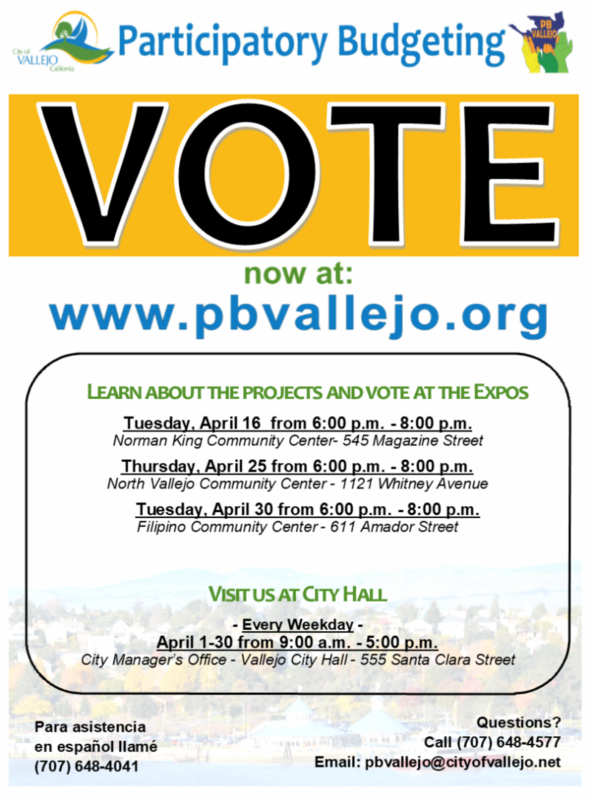 VALLEJO, CA - The City of Vallejo officially announces that the Cycle 6 Participatory Budgeting (PB) Vote begins today, April 1, through April 30. Vallejo residents, including those living in the unincorporated areas, will have the opportunity to vote on how to spend a portion of Measure B revenues on community projects to improve the City. Vallejoans who are 14 years and older can vote online at www.pbvallejo.org, on their computer or mobile device, or in-person in the City Manager's Office during business hours, located at 555 Santa Clara Street. The 12-proposal ballot gives residents the opportunity to vote for up to two projects. Projects are either infrastructure projects that would enhance City of Vallejo public infrastructure or the purchase of equipment, or programs and services projects that provide social services following the Federal Housing & Urban Development (HUD) Community Development Block Grant Guidelines, primarily targeting low- to moderate-income residents. The digital ballot and online voting platform was developed by Stanford University's Crowdsourced Democracy Team. 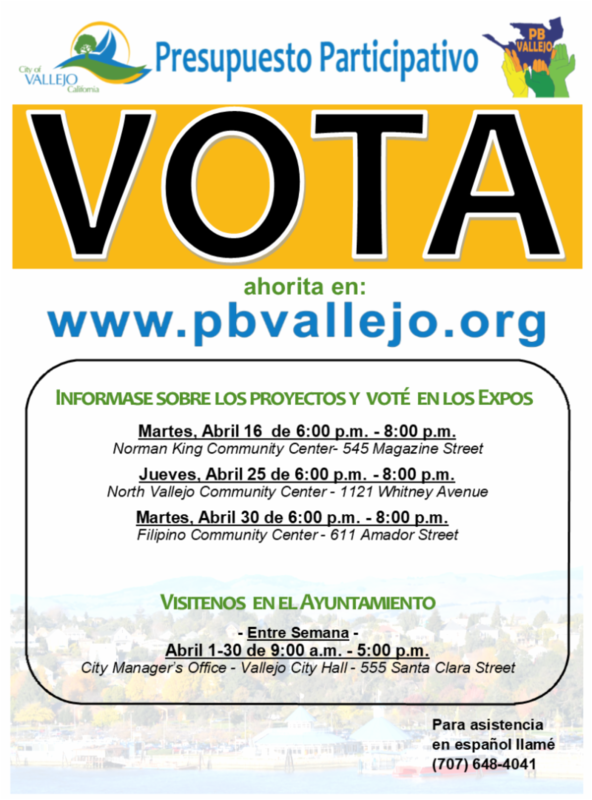 A cell phone number and valid Vallejo address is required for online voting. Project posters and a sample ballot can be viewed online. Norman King Community Center, 545 Magazine Street, Tuesday, April 16, 6:00 p.m. - 8:00 p.m.
North Vallejo Community Center, 1121 Whitney Avenue, Thursday, April 25, 6:00 p.m. - 8:00 p.m.
Filipino Community Center, 611 Amador Street, Tuesday, April 30, 6:00 p.m. - 8:00 p.m. The Cycle 6 ballot is the outcome of a 6-month process in which Vallejo volunteers and public agency staff liaisons screened, evaluated, and researched over 1,300 ideas submitted by members of the community. Community members had the opportunity to following proposal development on AppCivist, an online collaborative tool develop through a partnership with the Social Apps Lab at CITRIS, University of California, Berkeley. In 2012, Vallejo became the first in the U.S. to implement a city-wide participatory budgeting process. Funded by Measure B, a one-percent sales tax originally approved by voters in 2011. PB is a democratic process that elicits project ideas from residents and stakeholders. Community volunteers, with the support of City staff, develop ideas into full project proposals for a special ballot. At the conclusion of each PB cycle, Vallejo residents vote on which projects to recommend to the City Council for funding. Individuals or organizations interested in serving as poll workers or joining the Get Out the Vote (GOTV) outreach team, can register online. For additional information, visit www.pbvallejo.org or the PB Facebook page.